Thank you for your interest in a hot tub or spa from our store. This information should hopefully give you some idea of what products we have to offer. We deliberately do not put prices on our website, as we believe strongly that our products should be sold only by local servicing dealers. We will be happy to mail them to you, if you live within 75 miles of our store. For details, have a look at our Pricing Policy page. If you see something interesting, we encourage you to come in and see if there is anything on special this week. We carry Marquis Spas, one of the four leaders in hot tub manufacturing. They are the one with the best reputation for quality and customer service. Marquis features the best engineering, best design, and best quality materials and they’re particularly known for making the most comfortable, beautiful, easy-to-use spa. They feature cutting-edge electronics and software that produces clear, healthful water by automatically adjusting to how much you use your hot tub. Marquis is owned by its employees, but it’s run by its engineers. The Marquis difference is under the skin: balanced hydraulics, thoughtful jet placement, attention to detail, highest quality of materials, and a lack of “gimmicks” that are likely to break. The quality of their fit and finish is unsurpassed. That’s why they provide the absolute best, no-fine-print warranty in the industry. Their prices, however, typically run more than $2,000 lower than equivalently-featured spas from those other brands. You can learn more from the Marquis website: www.marquisspas.com. If you found us through internet research, you already know that Marquis is universally respected for quality and standing behind their product. If you remember what people said in those comparison sites about how much they paid for their spa, you will also see that our prices are about $1,000 less than what people around the country have paid for their Marquis Spa. You can learn more about how Marquis operates as an employee-owned company below. How are you supposed to choose which hot tub is right for you without trying it out first? Come and luxuriate in our mood room. We provide you with robes, towels, sandals, and a shower to use. You can turn the overhead lights off, the spa lights on, and learn what makes our tubs the best around. Our store enjoys a pretty remarkable reputation for quality, value, and service. If you have not heard of our reputation, we encourage you to ask around – after 30 years in the Nashua area, we are well known. We have the largest parts department and water laboratory of any pool or spa store in the northeast. We service our spas with five of our own factory-trained technicians; several with ten to twenty years experience. We are the store that helps spa owners who have purchased spas everywhere else, because we’re willing to spend time helping people who are going to spend less than $6,000 that day. Ask your friends who bought a spa somewhere else, how hard it is to get the time of day from that store now that the spa is paid for. Our commitment to caring for every customer before and after the sale, and no matter how much or how little money they may be spending, will be hopefully seen even in your first visit. We guarantee that our prices are the lowest, for 30 days and 300 square miles. The details are posted on our website and right next to the cash register. Your price guarantee starts when you put a deposit on your spa, and continues until 30 days after you take it. That means if we put it on sale, or a competitor puts it on sale. That means that it is to your advantage to not wait until the last minute. Putting a deposit on a hot tub two months before you take it ends up giving you three months of price protection. Finally please try out a hot tub here in our store. We can isolate any running tub behind privacy screens. We have robes, towels, sandals, a changing room, and a shower available for you – just bring your bathing suit. Or, use the private hot tub testing room, lock the door, turn on the stereo and no one will know what you’re wearing! We can readily move water between tubs, and even move different tubs into the testing room, so that you can try out anything in stock. Trying to choose a hot tub can be difficult if you are just trying to add up numbers: pumps, volts, horsepower, jets, gallons, zones, amps, etc. Comfort, though, is still the bottom line. Make it easy on yourself. First, pick a store, then try out a few tubs until you find the most comfortable one. Since this is probably the store on which you will rely in the future: for advice, parts, service, accessories, free water testing, etc. Why not start right here? P.S. Take a look at our FREE Buyer Protection Plan. It gives you easily $1,000 in FREE services and guarantees with any new hot tub purchased from us. It’s just unbelievable – and no one else stands behind you so well. P.P.S. You’ve probably noticed that we use the term “spa” and “hot tub” interchangeably. Originally, a hot tub referred to the first hot-soak vessels that were made from old wine barrels in California, cut in half. Later, cooperages made new, larger hot tubs as a side business from making wine barrels. Spas are a more recent invention, originally made from formed fiberglass with a gel coat that allows comfortable seating, complex jetting, and insulation. You, the public, insist on calling all of them hot tubs (or even worse, jacuzzis, which is a name that was originally trademarked by the Jacuzzi family and is now owned by two different competing companies). We’re not purists. If you want to call everything a hot tub, so do we. Did you know Marquis® is employee-owned? And what does that mean at Marquis? Marquis was founded in 1980, and in 1999, Marquis became employee-owned. While we’ve always had a reputation for quality products, with the company becoming employee-owned, a new dimension of pride in the products we manufacture surfaced. All employee-owners take the ownership responsibility very seriously as each has a vested interest in the success of Marquis. Such a commitment has led to the highest level of product quality and reliability. At Marquis, we share the financial results with our employee-owners once a month. These monthly meetings, called What’s Happening At Marquis (WHAM), is not only a great way to share our financials, but we also discuss potential issues in the manufacturing process, upcoming events, and celebrate happy occasions such as birthdays and anniversaries. These meetings offer employees an opportunity to ask questions of upper management. If the employee-owners are not comfortable asking questions in a large group setting, there is a suggestion box where they can ask questions anonymously if they choose to. Then these questions get answered at WHAM. These monthly meetings are run by a committee, referred to as the Employee Affairs Committee. This committee is comprised of employees from a wide cross-section of functions at Marquis. The group is in charge of all employee events and they decide on the bulk of Marquis’ community involvement events. Another important role they serve is as a go between for management and employees. They help resolve any issues that may arise, ask and answer questions and generally help ensure the corporate climate is the best it can be. A Marquis dealer is part of what we refer to as the Marquis family. To us, we truly are family. We are all in this together, working to provide the Ultimate Hot Tub Experience to our customers. Marquis is indeed a different kind of company, a caring company, because we all have a vested interest. We can proudly tell every customer that we are an employee-owned company that makes products right here in the U.S. We are a company with a long history of making quality products. Reprinted from the Marquis Newsletter, July, 2013. It was employee-owners who decided to both glue and clamp their hoses. Double the work, but twice as stable. It was the employee-owners who put constant attention to quality, at the expense of marketing. They decided to drop aquarium-style circulation pumps and convert to computer-controlled variable filtration. They are personally embarrassed by defects, and would rather make a little less money and be proud of their products. This, of course, is the opposite of stockholders and management of public corporations. 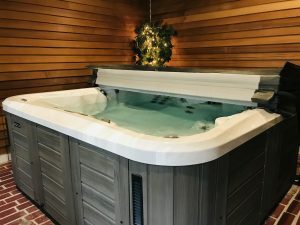 Many of the employee-owners own Marquis hot tubs, and many are provided a different hot tub every few months from Marquis and other brands; new and used. Why? Because feeling is believing. The best way to judge their own workmanship is to use theirs and the competitors’ every day at home. And that’s why we carry Marquis. Their commitment to quality is the same as ours. and to learn more about Marquis Spas, and Celebrity Hot Tubs.